The florist variety of cyclamen (C. persicum) was ‘the plant’ during the Christmas holiday in the Victorian era; today it is making a comeback in popularity. The name cyclamen comes from the Greek word circle referring to the round corm from which it grows. It has also been called Poor mans orchid, Alpine violet and Persian violet. The uniquely shaped flowers usually have 5 petals that can be single, double or delicately ruffled which come in shades of pink, purple, salmon, fuchsia, mauve, red and pure white as well as two-toned petals. They are sometimes described as a cluster of butterflies hovering over a rosette of variegated leaves. The flower stalks rise above the round-heart shaped leaves that are marked with a silvery marbling or wide silver margins. The plants range in size from a large standard that grows up to 14 inches tall to the f-1 hybrid minis which are prolific bloomers. Florist cyclamen is a cool season blooming houseplant that with proper care can last on average 2-3 months or longer. It requires bright indirect light and should be placed in the coolest room in the house with night temperatures of 50F and around 65F during the day. To maintain longer bloom time provide high humidity (pebble tray) and keep it away from heating vents. Even soil moisture is essential, therefore, water the plant from the bottom by emersing the pot in a water-filled bowl. Another option is to water in the side of the pot avoiding the tuber and leaves. Be sure to drain off all excess water. Avoid pouring water directly on the tuber as this can cause the tuber to rot. Allow the plant to dry a bit before watering again. 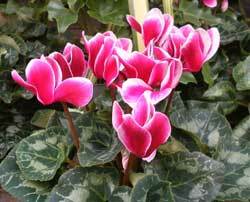 Feed your Cyclamen with 1/2 strength of a well balanced liquid fertilizer every 3-4 weeks. Too much fertilizer will produce more leaves than flowers. Remove any faded flowers and yellowed or damaged leaves by twisting the stem at the base of the corm and pulling it sharply. Yellow foliage can indicate that the plant is too warm or too wet. Yellow leaves with brown spots are a sign of fungal disease Botrytis). Cyclamen is not easy to rebloom but it can be done. Some will just discard the plant when blooming is done while others will take on the challenge. Here’s how its done. When the plant is finished blooming, gradually reduce watering. Once the leaves turn yellow, stop watering all together. This will coax the cyclamen into dormancy which it needs to rebloom next year. Store the corms in their pot or take them out of the pot put in paper bag and store in a cool (50F), dry, dark place. In May or June replant the corms 1/2 above the soil line in fresh soil place in bright cool room. Begin to water and fertilize regularly. When new growth appears, move the plant to a shady spot in the summer. Once cooler weather sets in (autumn) bring it back inside to enjoy the blooms. I purchased a purple cyclamen last May. It is now reblooming in a hot pink color. Is this unusual? It can happen. Can be due to different light conditions, temperature or fertilizer. My cyclamen has been healthy and flowering for 1.5 years. It is on our patio in a cool spot. suddenly it has become covered with small black ants and some aphid-like nunus under the leaves. Please advise me how to avoid this and prolong its beautiful life. Congratulations on growing your cyclamen for 1.5 years. They usually last one season and then the bulb needs a rest period to regenerate. An older plant is more susceptible to disease and insects. Ants are attracted to aphids because they produce honeydew (sticky clear substance). Try spraying the plant with insecticidal soap or just wash the leaves with running water. Hopefully, that will do the trick. care. At one time it had twenty-six blooms and I treasure it. Am I using the right product? As bulbs get older, they will have a tendency to become more susceptible to disease. I’m not sure what your cyclamen is suffering from but I suspect its a fungal or bacterial disease. Try a fungicide and make sure you keep the soil on the dry side. It may be dying or going dormant. My boyfriend gave me a cyclamen plant that I treasure because It has beautiful leaves and it always blooms. I keep it in the north window of my kitchen. There is no vents for ventilation there. This last week, I took it out of the window ledge because the outside air reached 93 degrees F for three 3 days in a row. My plant loves cooler temps. The green leaves have started to turn yellow . That stopped after I changed their site. Thank goodness. It is thriving in its present location. New leaves are growing and New flowers are starting to grow too. It is such a beautiful flower to watch its growth pattern. This site was very interesting and helpful to read; thank you very much. I live in Houston, TX., and I plant cyclamen in my yard every year, usually in October. They bloom all Winter and most of Spring. (Our Spring is like Summer most places). I always get compliments on them. Sometimes the bulbs from the previous years rebloom, but they usually rot if I leave them in the ground all year. This year I’m going to try to dig them up and store them until next October and see how they do when I replant them. The bulbs are enormous! Should I store them in a paper bag or some organic matter. That’s pretty much the only cool place around here. You can store the corms in some peat moss or potting soil in pots or a paper bag, in a cool (50F), dry, dark place. Another thing you might consider is to plant them in an area where the soil doesn’t get watered too much or stays wet during the summer. That’s why they are rotting. Wow that’s a keeper. Give the right conditions cyclamen can bloom for a long time but I have not heard of it blooming for several years. I am wondering how long it takes for a tuber to flower when grown from seed? Does it depend on the size of the tuber? Yes, size does matter. Generally, the larger the tuber the better/bigger the flower. Grow from seedI have been successfully propagating cyclamen from seeds. Some of the tubers are the size of a pea after 12 months. I was wondering how long it takes for a cyclamen to flower when grown from seed? Does it depend on the size of the tuber? Seed grown plants can bloom in a little as eight months. i have a beautiful red cyclamen on my tiled kitchen window sill, the plant is healthy, lovely green leaves and beautiful flowers, however every day on the window sill are dozens of little black dots, are these pests or seeds, i clean them away and there is just as many back the next day. thank you. I’m not sure what is causing the black dots. It could be from some type of insect residue. Check the plant closely for insects. Look underneath the leaves. One possibility is cyclamen mites that leave specks when they feed. Usually, they are in the center of the plant and difficult to see. Seeds would be firm and round. I rec’d a beautiful Cyclamen plant is Aug. for a gift, Had beautiful blooms, I had visited a sight which said it likes very indirect light, I put it in a room that gets the sun from the E. & has curtains, so the light is very filtered. However, the leaves were all yellow, & then I made the mistake of cutting off all the leaves & blooms too as they appeared dead. Now I see it was going dormant, I have saved the bulb.. SHould I keep it or discard it. I have had two Cyclamen plants, in the same pot, for at least 5 years. It has always had green leaves and flowers regularly. My question is, now after removing flowers and leaves over the years each bulb,or corn, has a long main stem that is sticking up out of the middle of each that are bare. Should I replant both of the bulb/corns or just add soil to the top. They are still in the original plastic pot that they came in. I was thinking of repoting but after reading some of the posts now I am not sure. The leaves are really long and there are new flowers starting all the time. HELP!! misting with vinegar solution several times a day. cleaning leaves and stems with mild dish soap solution. Last ditch effort after 3 months of recurring mold: misting with a very mild bleach solution. The cyclamen looked grouchy for a couple days, but it took its medicine and survived. It’s been 6 months, and both plants are now shiny and happy. The cyclamen has been blooming since Christmas. Hello read comments a lot of good advise. Got my husband one 5 months ago while he was in hospital Red blooms We have lots of buds at the end of the stems. When the ripen do they have to be all planted can you save seeds and plant later. This plant has about10 to 15 seed pods Please advise me what to do. We just love this plant. For best germination sow your cyclamen seeds when they are fresh. When the capsules begin to open, take out the seeds and soak them for 12 hours before planting. Soak the seeds in warm water with a dash of dishwash soap to soften the seed coat and remove the mucus. Rinse in clean water before planting. You can save the seeds in the frig for less than a year. Sow the seeds in seed starter mix and sharp grit or a peat lite mix. Cover with 1/4″ to 1/8″ of soil mix. Water in and place in a clear plastic bag. Keep medium moist in a dark place at 68F. Once seeds germinate, remove from plastic bag and move to a lightly shaded area with lots of humidity. Too much light or low humidity will cause seedlings to dry up and shrivel. I would really like this plant to bloom again next year. Should I continue to let it have the new growth, or should I taper off watering and let it dry out to go dormant?? thanks so much! You don’t mention what the plant looks like. If it is full with lots of leaves and new leaves, then feed it with a balanced houseplant fertilizer) and let it continue to grow. If the plant is scrawny, with a few leaves and producing smaller sized leaves then it needs to go dormant. I have been fertilizing sparingly as the plant produces quite an abundant amount of both leaves and flowers. My office is very bright with mid morning sun and flourescent lights which are on all day. I also have a full spectrum lamp on my desk as it eases my eye strain. Could it be too bright for the plant? It’s not the light but may be the temperature. They really like cooler temps in the 50’s/60’s and your office is probably at lot warmer than that. I was gifted with cyclamen last year that was in dire need of care. I revived the plant and had nearly a full year of large beautiful pink flowers but my one complaint is that the leaves and blossoms are a bit too large for the stalks, they fall over the edge of the pot which makes them a little less than stunning. I am wondering if the pot is too large; can I transplant to a smaller pot? or should I just get a support ring or a pot that is deeper? Oh,and btw I see several posts about limp plants. Over or under watering can certainly cause this but so too can having the plant in too warm a climate. . . I found out very quickly when I put this plant in my office window that this plant loves the sun but not the heat it generates. For those that feel certain the watering is not the problem with their limp cyclamen check the temperature it may be too warm where you have it, move it away from direct sunlight and heat vents. It may be that your cyclamen needs more bright indirect light. Have you been fertilizing the plant? I love the persian cyclamen. Here in South Texas it is very popular as a pot plant. I plant it in the ground outside. After many years I have learned the hard way how to be successful. I grow them outside when night temperatures drop consistently below 70 degrees F (20 C) here that is the coldest 6 months of the year (October to April). They must have perfect drainage. I plant them in sand mixed with humus and some native clay derived from limestone. I add sulfur or chelated iron to counteract the lime in my soil and tapwater. I grow them full sun or part shade. When temperatures heat up in mid-spring, the plants lose vigor and that tells me it is time to remove them. I place them in pots and withhold watering. When all the folliage is dead, I move the pots to my airconditioned house where I store them in a closet until temperature cool in the fall. If the temperature drops below 25% F ( -4 C) I mound over the plant’s leaves with leaves that I had raked up from trees. Here that only happens about 3 times a winter on the average. Thanks for the great growing info on Cyclamen. I have a Cyclamen that has been on my desk at work for the past year or so. It is healthy and flowers occasionally. However, the “sticky” seeds it produces are ALL over the other objects on my desk. Is there some way to contain them or avoid them from occurring? I am somewhat considering disposing of the plant because it makes such a mess! Thanks so much for any advice!! I have not heard of this problem.The sticky seed coating (pale brown and darkens with age) is there to attract ants, which in turn distribute the seeds. How about cutting off the flower head when it starts to fade, that way it will not produce seed heads and elliminate the problem. I recently purchased a couple of cyclamen for my daughter and myself.WE both love them very much and was wondering if they can be seperated?We have looked at them and they look like they have a root ball instead of a corm. do we need to wait for the seed pods or what? HELP!!!! we live in zone 6 and was also wondering if they can be planted outside in our flower beds? PLEASE HELP!!! I recently got a cyclamen. I was trying to identify what type it was, but I cannot find any pictures that match the leaf pattern. Are the patterns variable to the point that it’s not easy? My plant has slightly jagged leaf edges and a light green heart shape with a dark green center, the distribution of color is about 50/50. The very edges of the leaves have about 1-2mm of dark green. The flower is a dark purplish pink, with a darker purple at the base of them. They’re very pretty, I look forward to having them for a long time, but I would like to know what type they are so as to better care for them. Sorry, I can’t give you the exact cultivar of your cyclamen. It is probably the florist variety (cyclamen persicum). If you are growing it indoors in a pot, the care is the same (except the hardy cyclamen). See the above article on cyclamen care. Thanks for all the information on your site. I purchased a beautiful cyclamen in Feb. in Florida. The white flowers are ruffled. I am afraid I am losing the plant. I am now back in Westchester N. Y. I have raised cyclamen before quite successfully but this time something is not right, It is near a West large window but I keep it somewhat shaded under part of a table. My orchids are doing just fine there. I do water from the bottom only what the plant will absorb in a short time, The leaves and whatever flowers seem to be dying by turning wet at the base, I tried keeping it more dry but that did not seem to work. HELP!!!! MY CYCLAMEN HAS DEVELOPED A STICKY COLOURLESS LIQUID ON ITS LEAVES AND BENEATH SOME OF THEM ARE SMALL FLAT POD LIKE THINGS WHICH I SCRAPE OFF. BUT I HAVE VERY FEW FLOWERS. OBVIOUSLY ALL IS NOT WELL AND I WOULD BE VERY GRATEFUL FOR ANY ADVISE YOU CAN GIVE ME TO ERADICATE THIS PEST AS I HAVE HAD MY PLANT FOR OVER 3 YEARS AND HAVE RE POTTED IT TWICE. I AM ALSO VERY FOND OF IT. It sounds as if your cyclamen has scale. I HAVE JUST STORED A CYCLAMEN IN PAPER BAG AS SUGESTED HOPE IT IS OK IN JUNE READY TO RESTART INTO GROWTH ??? Yes, you can store your cyclamen in a paper bag and keep them in a cool (50), dry, dark place for at least 6-8 weeks, then repot. I love your information and straight forward advice. I have a question for you… My Cyclamen has been active since before April ’09 when I received it. It has consistantly bloomed although there seems to be less and less leaves. 🙁 I did not know to let dry out and rest. It is now January here in Ohio (Cleveland area) and very cold. What would you advise me to do? Should I slow down my watering now or later to start the dormant cycle? BTW I am a very bad plant mommy, according to your information. I water from the top, every 7-14 days about 3/4 to a 1c full… LOL Also, before this Cyclamen I have killed many many plants… I believe it likes the fact that I stress it out with odd waterings and direct light. My apartment is kept about 73 in summer and 68 in winter. Occasionally, there are Cyclamen that will bloom for a long time. You were lucky to get one-not many do. It must like what you’re doing. Now that it is producing less leaves, it is probably running out of steam. You may want to water less and let it go dormant especially if the plant is scrawny. The other option is to fertilize with 1/2 strength houseplant fertilizer and see if it perks up and continues to bloom and grow through the winter and then let it go dormant in spring. I don’t know if that will work but its worth a try. We brought in our cycleman about a month ago, when it had quite a few leaves. I fertilized it, and put it in a sunny window. While I have many more leaves, half of the leaves have large “chewed up” missing areas. The plant appears to be OK, but what is causing the large missing parts of the leaves?? Do you have pets in the house? Is the plant indoors? I have had a very different experience with Cyclamens,I love and adore my plant, and have just bought another, and replanted 3 seedlings that had come through in the original mothers pot. I was given mine as a gift, with no tags no instructions nothing, so I put it on my back window and watered every day,but just a small amount, the flowers would droop, then stand up later in the day after I had watered it. I had just assumed it was like a daisy in that respect, and it was to do with the light more than anything! I know so little about plants! But I changed its window, and began watering it more always from the top. It has gone yellow a couple of times and I have always just cut back the yellow leaves, I never knew that they went dormant! Mine certainly never has, and it has never had any fertilisers, just new compost when it got bigger and was repotted, and the occasional drink of tea. I top watered, daily, or at least every other day, when it got spindley and overly leafy, I cut back the extra growth to allow it to concentrate on the blooms, always keeping some foliage, and it has thrived, never gone dormant, and has shot up 3 babies along side! I never knew that they could self sow, and over the last 18 months I have had dozens of pods I could have sewn. The base of the plant looked like it was 3 separate plants and I was going to split them up, but it is just one corm and all reccomendations say not to do that, so I wont, I dont want to hurt my gorgeous wee plant. I have just sewn one pot of seeds today from the last bloom I had left, and will see how it comes on from there, I will be sewing a whole lot more, because the original is just starting to sprout new blooms, and the new one is in full flower with a huge amount of extra growth on the way, I love these, and am totally hooked now. Does keeping them in bloom like this reduce the life span of the plant in any way? Or am I safe to continue treating it as I have? Lucky you! Apparently, your cyclamen doesn’t need a dormant period for now. I’m not sure if continued bloom it will reduce its lifespan, I don’t think so. It continues to bloom and is reproducing because it is getting everything it needs. The plant will let you know when it runs out of steam. Let us know your success on seed sowing. Sow them when they are fresh and keep them dark. Enjoy and count your blessings. First, the cyclamen I bought last year doesn’t look like any photos I’ve seen…the leaves grow to be about 4×4 inches and the stems are about 8 inches long. They droop over the sides of the pot like a spider plant but at least my flowers will grow straight up. Also, I managed my way through dormancy and am about to enjoy my second round of bloom. The soil on the top of my plant is crunchy, should I replant or just add more soil to the top around the outside of the corm? If the cyclamen corm is in last years soil, I would replant it in fresh soil when new growth starts. You will get much better growing results with fresh soil and nutrients. If your cyclamen is fully grown, ready to bloom at this time then just scrape off some of the crusty top soil and add fresh soil. Can you send us a picture of your plant? I received two cyclamen bulbs that are fully dormant. I want to grow them but have a couple of questions. Which side is up. I assume the convex side goes down but I’m not sure. Also, recommendations state that the bulb should be planted about a half inch deep. For my 3 inch bulbs, this will leave the top exposed. Is this ok? It is difficult to determine which is up with the dried tubers. If you see any signs of growing points, that is the side that goes up. One way is to put the tuber in moist peat moss for a few days to look for signs of new growth. The tuber should be half buried in the soil with the top exposed. Can anyone help me please.I have aquired some seed pods from outdoor cyclamens,and unsure what to do to grow them on. Do I open the pods and plant the seeds into pots or do I plant the whole pod? When the pods dry, they will open and release the seeds. Hi! I have just noticed there are two places on the tuber where leaves are beginning to grow. Should I allow all of them to mature? Or should I remove the ones from one spot and just allow the others to grow? Let all the leaves grow on your cyclamen. You will get a fuller plant. Hi! I have a cyclamen that is 3 years old sitting on my desk at work. It is constantly blooming. Still in the original pot it came in. I water from the bottom. My question is – why are the stems of the flowers long? They cause the flower to droop over the leaves and the side of the pot. They are not erect like the pictures I’ve seen. I love this plant because it’s so unique the way the flowers grow!! Thanks for any advice/information you can give me. The problem may be that your office is too warm and not enough light. Cyclamen bloom best in cool temperatures (50’sF)and high light otherwise the stems tend to elongate and droop. To extend blooming remove the spent flowers from the base, this will help induce more flowers. Fertilize your cyclamen with a 1/2 strength soluble houseplant fertilizer. Apply every 3-4 weeks starting about a month after it started to bloom. I received a pot of cyclamens as a gift end of Jan of this year. I’m a beginner and I am pretty sure I killed the plant by overwatering it (I used to water it everyday without knowing that’s too much). At one point, the soil remained moist for weeks and the plant seemed to have stopped absorbing the water. Right now, most of the flowers have wilted but there are still some nice green leaves sticking around, although they are slowly turning yellow too. There used to be flower and leave buds but even they have wilted before blooming. Can my plant be saved? Should I let the remaining leaves die off and wait for it to rebloom next year? And when should I replant if it isn’t completely dead yet? Your cyclamen is going dormant, so let it die back. See the above article on what to do and how to store it for rebloom. I have a Cyclamen producing pink blooms, I have the same problem each time I get a third bloom. One of the petals tends to go blue and rather dry just at the top of the petal. Can anyone enlighten me as to the cause if this problem please ?? Thank you !!!!!!!! Apart from this minor issue the plant appears very healthy. It’s difficult to say what is causing the petal discoloration. It could also be an insect(Cyclamen mite which causes distorted buds and leaves, shortens bloom time ) or a slight fungal problem (Botrytis causes spotting of petals). Hi. I live in the UK and my friend bought me a cyclamen about 3 weeks ago as a houseplant. I know it’s not happy, but I can’t work out exactly what is the problem. After a few days, some of it’s leaves started turning yellow, so I tried reducing the temperature of the room (it’s a south facing room so can get quite warm and I have it as far from the window as possible) – but a friend told me underwatering also caused yellow leaves… I have only watered from the bottom, and as soon as it stopped ‘drinking’ poured any excess water away and left between 3-5 days between watering. It doesn’t seem to be producing any new leaves, but is still producing buds. Most of the flowers are upright but I don’t feel they are standng as ‘firm’ as they should and they have all faded a little in colour since I first got it. Some of the flowers are totally flopped over – is this wilting from underwatering or rotting from overwatering? Or maybe I am still suffering a temperature problem? And is it too late to do anything to remedy the problem? Many thanks for any advice you may be able to give – I really want to save my little plant. Hi, I live in Sunnyvale, California. I am new to gardening even though I love plants. I have a few Cyclamen planted in a shaded area outdoors. I have left them there and this is the 2nd year that they are blooming nicely. What kind of fertilizer should I use so that the plants stay healthy and how often? Any other advise. Also, what should I feed the Geraniums? Thanks a lot for your suggestions. Cyclamen grown outdoors do not require a lot of fertilizer. A side dressing of compost or a balanced fertilizer(10-10-10) or slow release fertilizer in late summer while the plant is dormant will do the trick. To much fertilizer can produce lots of leaves on floppy weak stems. Geraniums grown in the ground can also be fed at planting time with the same fertilizer and once a month when they are actively growing. Check manufacturer label. Plants grown outdoors in the ground require less fertilizers than those grown on containers as most of the nutrients tend to get washed out with watering. I received a Cyclamen as a gift about 3.5 weeks ago and made the mistake of watering it from above. I haven’t watered it that often as the soil has felt moist. Nevertheless, the blooms have all died off and the leaves are droopy. I think they may be rotting as they are very limp and squishy to the touch. Is there any way for me to save this plant? There is nothing you can do at this point but wait. Cut back on the watering and let the soil dry out slightly, if the plant recovers, it will send out new leaves. The other possiblity is that your cyclamen is finished blooming and is going to a dormant(resting stage), if so stop watering and let the plant dry out. see above article for reblooming. I plan to dig up a very large area of caladiums and save the bulbs for next year. In its place I have bought 48 4″ cyclamens. I have a compost mixture to mix with the current soil and a blue fertilizer to spread on top. Do I need to wait after preparing the soil any time before planting the cyclamens? It sounds like you have the “florist cyclamen”. If you are in a warmer climate zone 9-10 where cyclamen will not freeze, you can plant them. They enjoy cooler winter temperatures in warmer climates and will continue to bloom until a freeze hits (25F) them. They usually die back in summer with warmer temperatures. There are hardier varieties that will with stand freezing temperatures. I RECIEVED A CYCLAMEN ON THURSDAY THE 2 OF OCTOBER THIS MORNING GOT UP AND IT WAS LIMP, SO I TRIED TO GIVE IT A LITTLE WATER BUT IT IS STILL AS LIMP AS IT WAS THIS MORNING. WHAT CAN I DO? PLEASE HELP ME LITTLE PLANT! ANYONE OUT THERE CAN HELP ME! It doesn’t sound like your cyclamen needs water, in fact it may have been overwatered causing root rot. Keep it in a cool sunny spot and let it dry out between watering. Maybe it will perk up. I brought a brand new Cyclamen to my office a week ago and it looked great for a day or so but now is all droopy. I watered it from the bottom as I was told to at the flower shop, just filling the saucer with water every day. I read the post above and the soil is moist, so underwatering is not the problem — is it possible I ruined the plant by overwatering in just a week? I have it on the sill of an east-facing window but since it’s an office the climate is pretty much controlled, around 76 degrees I think. And since I’m in Texas, I don’t really have an option for storing in a “cool dry place” during the dormant period — it’s either on a windowsill or in the refrigerator 🙂 Maybe I’m not meant to raise this type of plant? It sounds like you got some poor advice. When you watered did you let the plant continuously sit in the water? If so you probably are drowning it. When watering from the bottom, let the plant absorb the water for 1 hr. at best and then drain out all the water to let the plant dry before watering again otherwise you will develop root rot. It’s easier to water from the top around the perimeter of the container, taking care not to water into the center of the plant. A cool, dry place can also be a closet or any air-conditioned area away from light. Hi I was just curious about the nature of the downturned flower buds. Is it just the way it is? Or is there an interesting evolutionary reason to it? As far as I know the downturned flower buds are part of the unique blooming cycle of the Cyclamen. I have a Cyclamen and my grandson likes to touch it and has pulled off some leaves and flowers once. Can this plant be toxic to small children? According to usa.safekids.org Cyclamen is listed as being toxic to children. It can be toxic if he eats it, which may cause a stomach ache or vomiting. I live in Northern California and was looking to replace all of my dead impatiens after the winter frost. A landscaper suggested planting Cyclamen in their place and Ive been enjoying them since Dec. Now that they are dying back I would like to plant the impatiens again. Can I dig up the corms and store them until Dec. again. I have about 15 by now and dont have enough room to transplant all of them in a shady area. Give them a chance to die back completely as they need to replenish nutrients back into the corm then you can dig them up and store them in a cool(50), dark area until you’re ready to replant them. Yes, high humidity and wet conditions with no air circulation will make it susceptible to mold and powdery mildew. Too much water will also encourage root rot. I got a cyclamen after my grandfather’s funeral last month, and it was a beautiful plant. It fell out of an east facing window, and several leaves and flowers were broken off. All the leaves and flowers are now dead. Did my cyclamen go into a dormant state? Or is it dead? What should I do? Wonderful site, and thank you for your time. It’s probably in a dormant stage, so just store it in a cool dry place, watering occasionally so the corm doesn’t dry out completely. Take it out in a few months when it starts to show some signs of new growth. There are several species of Cyclamen. If you are referring to the Florist Cyclamen- they are hardy in zone 9-10 (die in temps below 25 degrees) and usually are planted in pots for easier access; but in zones 9-10 can also be planted outdoors flat side up, 1/2â€³ deep provided you give them a well drained soil and cool humid conditions during the dormant period. There are hardier varieties (not quite as showy) that range from frost tender to very frost hardy. These can be planted outdoors in rich, well drained soil and sun or part-shade. Cyclamen will bloom from fall to early spring. If the corms are undisturbed and dry in the summer (dormant), they should grow larger each year. They will also reproduce from seed. The bulb companies should have a number of cultivars that will fit your needs. I realize, now, that I have over watered my cyclamen and poured the water straight on the plant. The leaves are turning yellow. How can I save my beautiful plant? How long have you had the plant? With the leaves turning yellow, it may be that the plant is going into a dormant stage. If it is not sending out new large leaves and flowers then it most likely is going dormant. Reduce watering and let the soil dry out, then store the pot in a cool dry place for a few months or until new growth begins. If it is sending out new leaves then it may be that the temperatures are too warm and the air too dry. Place the plant in a cooler and brighter environment. If you cannot keep the corms dry enough dig them up and store them in a cool place for 6-8 weeks and then replant. You can move the container to a shady, dry area and just leave it. In warmer weather, when flowering is over and leaf production declines, that will be your signal that your cyclamen is going dormant. Reduce the watering and let the foliage back back completely.The corms should get a bit of moisture while dormant, so they don’t dry up completely. They should start up again in the fall. I was given a beautiful bright red cyclamen at Christmas to look after by my father in law. He has been away for 3 weeks and the plant is now a definite pink! How do I get it to change colour back to the beautiful red? Is it possible? Change in flower color is affected by several factors: the amount of light, temperature, nutrients and age. Most likely as the flowers get older the color fades to a lighter shade. We have had a Cyclamen on our kitchen window-sill for two years now, and it blooms roughly every 2-3 months; this is a houseplant that no amount of neglect seems to kill! I’m surprised people have any trouble at all. My cyclamen experience has apparently been atypical. It is a great plant and sounds like you’ve really lucked out. Do you fertilize it regularily? They are listed by the cfainc.org as poisonous to cats. The only suggestion I have is to keep the plant out of reach to the cat. Are cyclamen poisonous to dogs? Would like to keep them as a centerpiece on a coffee table. But, if there is any danger, I will put them on a high shelf. According to the NAPCC cyclamen is listed as being toxic to animals causing symptoms of voniting, gastrointestinal inflamation, death. I just read your Q & A site and I am so mad at myself for not seeing it earlier. After Mother’s Day I bought three beautiful Cyclamen for $1 each because they were going to throw them away. I took them home and repotted them and set them beside my house in a mostly shady spot. They did well for a month then the white one began to die off so I threw it away. I did not realize that they go dormant! The other two are still blooming like crazy but the red on is beginning to lose leaves like the first one. I know what to do now. Thanks! They are my favorite potted plants in my garden. It is one of my favorite as well. Thanks for your comment. My mother sent me a cyclamen about two weeks ago and it’s gone all droopy. My apartment has gotten quite warm with the spring weather; is the heat damaging the plant? Is there anything I can do to bring it back to its original state, or is it better to just chuck it out? Cyclamen like a cool, bright environment. It will droop in hot temperatures and if overwatered. If your plant doesn’t spring back, let it go dormant and save the tuber or if that’s too much trouble chuck it. Some blooming plants are meant to be disposable- enjoyed and then discarded. I purchased a cyclamen with a brilliant purple flower. It is on it’s second blooming and the flowers are now fuschia pink. Is there a way to return the flower to its original color. Do they react like hydrangeas to the type of soil? The amount of sunlight, temperature and nutrients can affect color intensity and I suspect that is what happened to your cyclamen. The “second time around cyclamen” usually aren’t as spectacular because we can’t provide those perfect greenhouse condtions they were originally grown in. Help! My boyfriend bought me a beautiful purple cyclamen last week and it was so healthy but now the WHOLE thing is limp! I didn’t think I watered it too much, only once a little bit. What do I do? If the soil is dry, the pot feels light and the plant is limp, then you did not water it enough. If the soil is moist and your plant is limp, then you may have a rot problem from overwatering, which may not be you fault. When watering be sure not to water into the center of the plant or water from the bottom. I work at a nursing home, and was given a Cyclamen by one of the residents because it was dying off. I never had one of these plants, so I am unsure if I am even able to bring it back to its former glory. It has only about 8 leaves that are still green (5 or 6 are very yellow, and the rest I pulled off because they were dead), and I noticed yesterday that it has a couple buds that are at the base of the plant. Is it worth my effort to bring this poor neglected plant back? and what do you suggest I do to accomplish this feat? The cyclamen may be dying back and getting reading for a resting stage. As long as it is putting out leaves and flowers, I would keep it watered and in a cool sunny spot. Some continue to grow and bloom for months but that is the exception. When it stops sending new growth reduce watering and store the corm in a cool, dark place see article above on reblooming cyclamen. It may not return to its former glory due to the fact that when they are grown in the greenhouse, they have optimal growing conditions of light, temperature and fertilizer; but with little care you can get it to rebloom. Sound like a Cyclamen. The leaves often have a pattern on them. One of my favorite plants. I have had my Cylamen for 4 years now. It blooms almost constantly! It has 1 window ledge in my house that it loves, but has outgrown it. Is it possible to divide the corm, or will that kill it? You have an unusual situation in that not everyone can have a Cyclamen that blooms continuosly for years. Congratualtions!! most cyclamen get discarded after blooming because it takes some knowledge and luck to get them to bloom again. I would leave well enough alone. Transplant it in a larger container and in the process remove the cormlets( if any below the mother corm) and plant them in small pots. I have read that someone actually did cut the corm in half and replanted in pots with success. see ext. nodak.edu/cyclamen . If you divide the mother corm be sure that it contains part of the basal plate (bottom of the corm). Division is not practical because the cut edge can get a rot and destroy the corm. I like to start new plants from leaves in water. My 1st cyclamen’s leaves turned yellow and I did not realize it will go through a dormant period. I cut the stems below the leaves and have them in water. Will they root? No, the leaves will not root in water. It will work with African Violets but not cyclamen. The best way to propagate cyclamen is with seed. Let your cyclamen go dormant and save the tuber, after a few months bring it out again and start watering. I received a cyclamen for a gift in 4/04. I was told this is one of the hardest plants to keep alive. I must have beginners luck because, my plant has bloomed ever since, and it gets a few yellow leaves on it every now and then; I just pull them off, and it keeps on blooming. I do water from the bottom; however I have never “fed” my plant. It is still producing in the smaller pot I received it in. It sits in an E-NE window all year. I am in MN. I want to transplant to a bigger pot, do you think this will ruin my wonderful luck with this supposed “stubborn” plant? I did get my Cyclamen to rebloom with absolutley no problem but now I have two bulb like objects coming out of it. Are those pods of some sort? It is almost done blooming and the leaves are turning yellow. If the pods are on the end of a stem that is the fertilized flower that now is a seed pod. Let it ripen and try to plant the seeds. A friend gave me a plant for Christmas named Cyclamen. It didn’t have any instructions for care. How do you care for such a plant? Thanks for any help or advice you can offer. Cyclamen was considered the plant for Christmas before the Poinsettia took over. It grows from a corm and is relatively easy to grow provided you give it what it needs. It requires cool temperatures(60-70), bright light and even moisture. Do not pour water into the center of the plant (can cause rot) but into the perimeter of the pot. Given the right environment it can last for several months. This is one of my favorite indoor plants not only do I like it for the exotic looking flowers as well as the interesting variation in the leaves. It’s an all around winner in my book.